Cooking with an Aga can be fabulous. It can also go horribly wrong, especially if you try and use it the same as you would a normal oven. 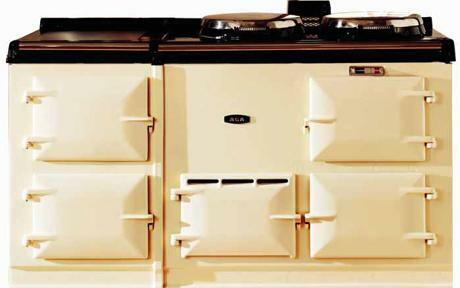 The Aga has extra doors, more opportunities for cooking and changes the feel of an entire room. I first discovered Moussaka while in Greece (how authentic!) and have cooked it in conventional ovens, slow cookers and, of course, Agas. This version, similar to how you would make it in a slow cooker is cooked in the top left door of the Aga if you have it turned up pretty hot, otherwise (or if you have a smaller Aga) in the bottom right oven. Begin by slicing the aubergine and frying it in batches on the hottest part of the Aga, I find it best not to use any oil when doing this, then set aside. Then slice the onions and garlic and sweat together (with a drop of oil) adding the lamb to brown once the onions have become transparent. Transfer to an ovenproof dish and stir in the tomatoes, stock, cinnamon, nutmeg and seasoning. Lay the cooked aubergine slices over the top to cover and place into the oven for about six hours. To make the topping mix the eggs, yoghurt and feta together in a bowl (you might need to grate the feta) and pour over the aubergine slices for the last hour or so of cooking. You will probably want to up the heat a bit for the last half hour or so to brown the top of the topping a little, so just move into the next hottest oven. This recipe works beautifully well with hogget or mutton mince instead of lamb and one of the best places to get said meat is from Annanwater Organics, who produce brilliant quality mince somewhere near Lockerbie. You can find them at the Edinburgh, Dumfries and Moffat farmers markets. This entry was posted in Cooking and tagged aga, cooking, dinner, eating, food, Greek food, lamb, slow cook. Bookmark the permalink.